Focaccia bread is one of the Italian bread I ask for when at a restaurant, it tastes awesome with shredded parmesan and olive oil. You can add bacon, caramelized onion, or cheese to focaccia bread but today we will make a simple version with rosemary. Focaccia bread is crispy from the outside and soft from the inside. One of the easiest bread to make and is ridiculously delicious. If you love focaccia bread, you will enjoy my Soft Garlic Knots with Parmesan. To make crispy and mouth-watering focaccia bread, you will need, all purpose flour, salt, yeast (I have used fast active yeast), water, sugar and olive oil. I like to make sure that the yeast is still alive and kicking. So, in a small bowl, I add the water, sugar, and yeast, I mix the ingredients all up and cover the bowl. I keep the bowl in a warm place for ten minutes and then later check if there is a froth or thick foam, that’s an indication that the yeast is good, and the dough will rise. In a different bowl, I add the flour and salt and gradually add the wet ingredients. Kneading the dough until it’s smooth for around five minutes or six and then add the olive oil and knead for two more minutes. The dough should be smooth and not sticking to your hand. Cover the dough until it doubles in size, and that takes an hour and a half to two hours. How to bake the perfect Focaccia bread? To bake good bread, you must bring the oven to the right temperature. In today’s recipe, you have to preheat the oven to 374F/190C. If your oven doesn’t prompt you when it reaches the desired temperature, then use the oven after fifteen minutes of turning it on, that’s usually a good time for an oven to preheat. Now that the dough has risen, you have two options, either spread the dough to a quarter of an inch high to get crispy focaccia or to half an inch to get a crispy layer from the outside with tender crumbs inside. Cover the dough and let it rise again for 30 minutes. Use your fingers to dimple the dough. Brush the dough with olive oil and sprinkle it with flake sea salt and dry or fresh rosemary. 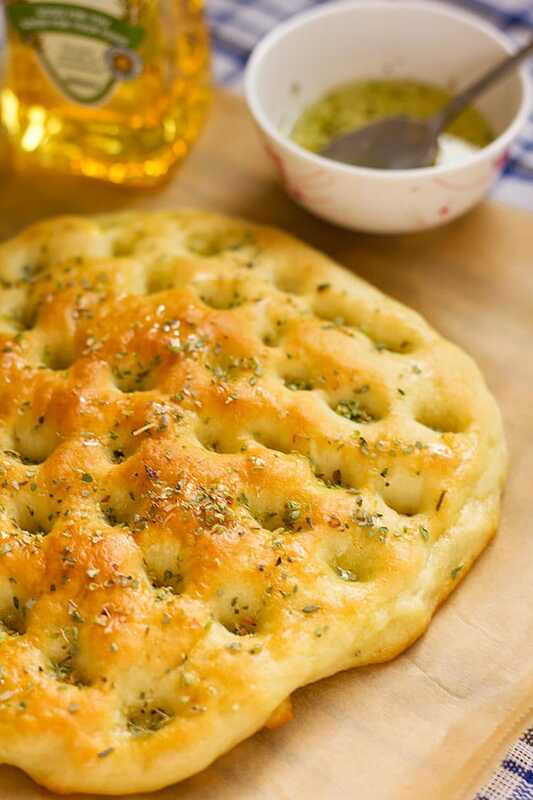 Bake the focaccia for 12 to 13 minutes or until golden in color. While warm brush with more olive oil if you wish and then serve. How to store focaccia bread? Wrap the focaccia bread in a plastic wrap and then with an aluminum foil and place it in the fridge for two days. You can also place the wrapped focaccia in the freezer for a month. When using frozen focaccia, it is best to allow it to come to room temperature and then heat it in the oven for a few minutes. How to serve homemade focaccia bread? You can toast the slices of focaccia bread and use it to enjoy your favorite dips. Cut the focaccia into cubes and toast it to use it in salads. Focaccia is perfect when served with stews and soups. This post was originally published in 2012 but it’s been edited with new text and images! Crispy from the outside and tender from the inside. This Italian bread is perfect with stews and dips. In a small bowl, add the water, sugar, and yeast, mix and then cover for ten minutes. After ten minutes if the mixture formed a froth then go ahead with the next step. In a different bowl, add the flour and the salt, then gradually add the yeast mixture and knead. 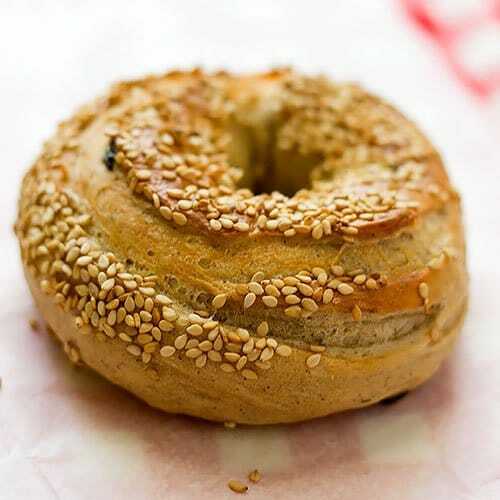 Knead for 5 minutes, when the dough is smooth and not sticky, add the olive oil and knead for three more minutes. Cover the dough and let it rise in warm place for an hour and a half or until it is double in size. Punch the dough and knead for 1 minute. Pat or roll the dough into a triangle, round, or square shape, place it on a lightly greased baking sheet. Make the dough quarter of an inch high if you want crispy focaccia, or make it ½ an inch high for thicker focaccia bread. Cover the dough and let it rise again for 30 minutes. 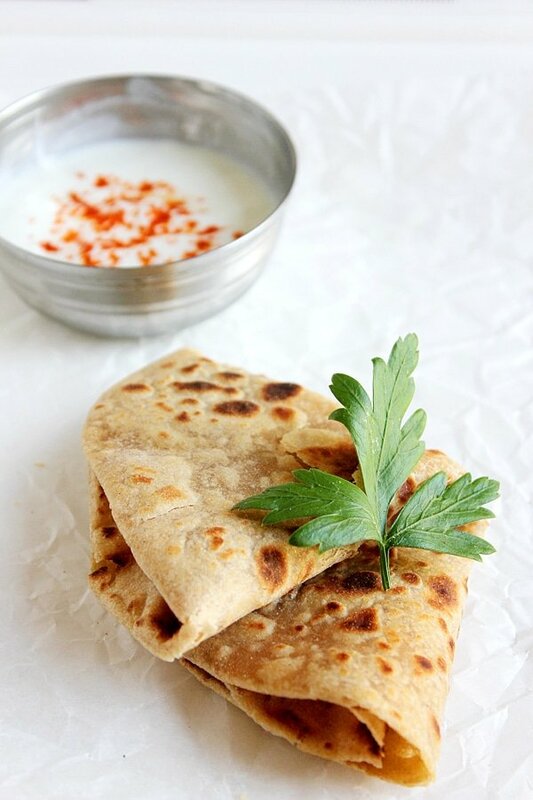 Using your fingers make few dimples on the surface of the dough. Brush the dough with olive oil. Sprinkle with flake sea salt and rosemary. Bake the focaccia bread for 12 to 13 minutes, until it is golden in color and has reached your desired crispness. 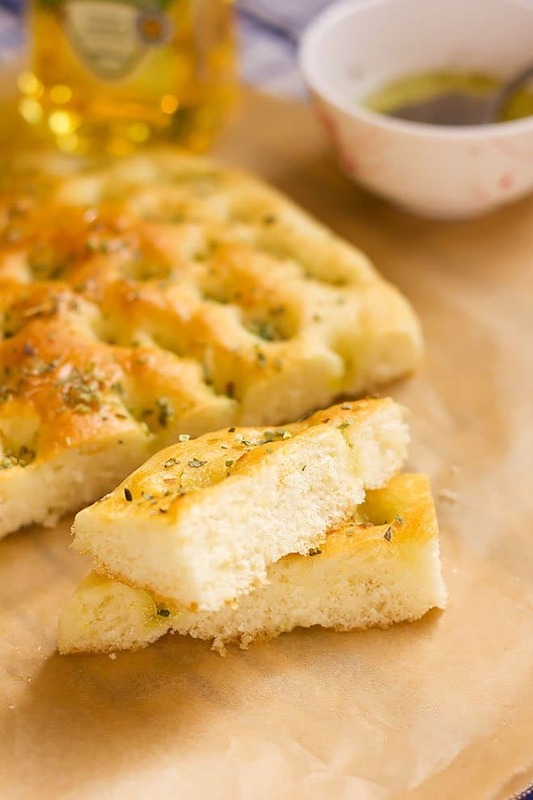 You can use olive oil infused with garlic to give this focaccia bread recipe more flavor. 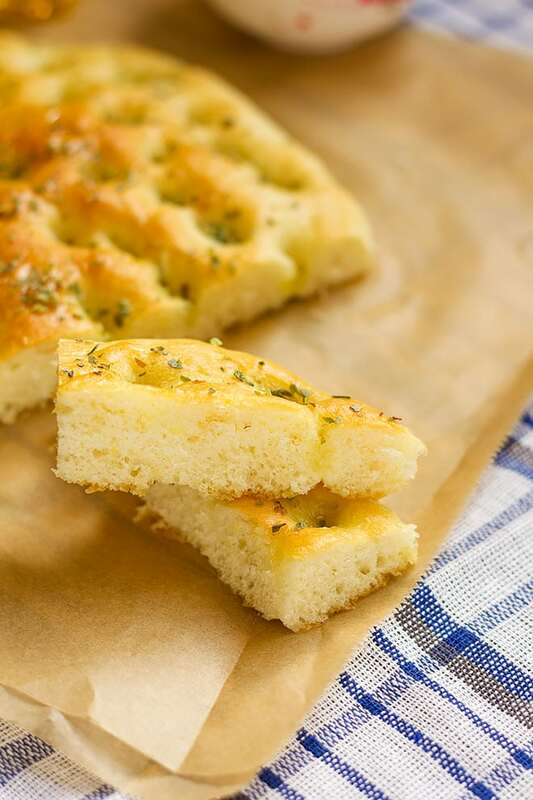 A great snack can be made using focaccia by toasting it and spreading roasted garlic and parmesan on top. You can prepare the dough a night ahead. Place the dough in a large container and cover tightly then refrigerate. The dough will rise slowly while in the fridge. When about to bake the dough, take it out of the fridge and let it come to room temperature first. Knead the dough for a minute, and it will be ready for next rise. This looks like perfect focaccia. This is by far one of my favorite breads! It’s my favorite, glad you liked the pics! 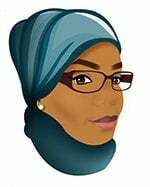 You did such a great job Muna! 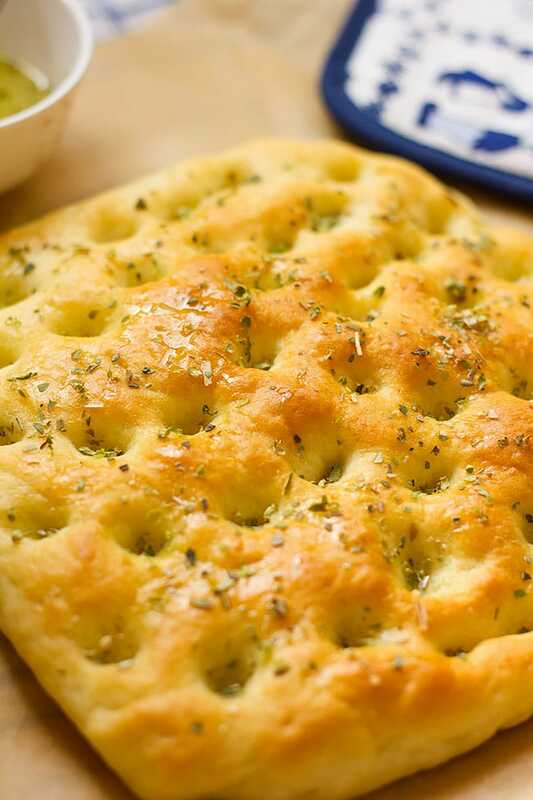 I love focaccia and yours look incredible! My mouth is watering just by looking at it!!! Gorgeous focaccia, Muna! This is one thing I’ve wanted to try making for a long time, but I still haven’t got the chance. Thanks for the reminder of how delicious it is! Your photos are stunning! Thanks guys, I appreciate your kind words! 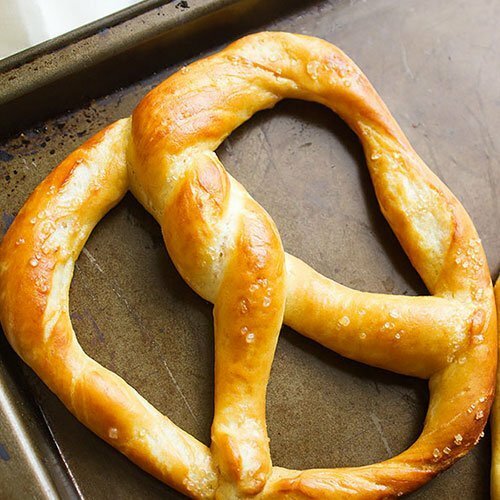 This has always been a favorite bread…looks fantastic! Focaccia has always been my favorite…. Thanks, I’m still working on my photography skill 🙂 believe me this bread looks even better than the picture. Beautiful! This focaccia is perfect.